Actaeon is the 6th and final of our “Greek Hero” series of training plans and deploys the most recent iteration of our Fluid Periodization model where we train the 5 fitness attributes of a military athlete ……. …..simultaneously but with cyclic emphasis. Actaeon has a slight strength and work capacity emphasis. Your strength work this cycle will concentrate on 4 classic MTI exercises and deploy “density” progression. Density progression is where you’ll complete a 1 rep max for each exercise, and then work to complete 4x reps at a significant percentage of your 1RM, every 90 seconds. We’ve found density progression a very effective methodology to increase an athletes “working strength.” Working strength is the ability to complete multiple reps at a high percentage of your 1 rep max. Working strength transfers directly to the field where most likely, a tactical athlete will be called upon to move something heavy, multiple times, rather than something really heavy, once. Actaeon also deploys our Quadzilla Complex weekly. This dumbbell and bodyweight leg complex comes from our work with pro skiers and trains eccentric leg strength. We deploy some classic Military Athlete work capacity events in Actaeon: Sandbag Getup intervals and loaded, 300m Shuttles. Sandbag getups are a 3 for 1 exercise – chassis integrity, work capacity and mental fitness. The 300m shuttle, loaded in your IBA or 25# weight vest, trains the most transferable of work capacity modes – sprint repeats. 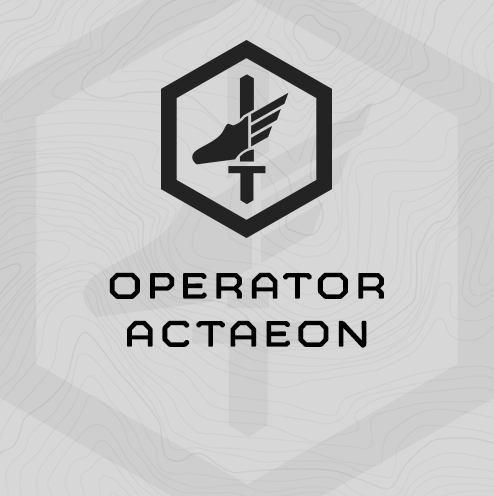 You’ll complete agility drills 2x/week during Actaeon. The Chassis Integrity work will focus on low back strength and strength endurance. You’re endurance work will be unloaded running on Fridays. 45-60 minutes. We found most of these sessions ran around 50 minutes, with the exception of Firiday’s long tral run. Fully equipped functional fitness gym including racks, barbells and bumper plates, sandbags (60# for women, 80# for men), dumbbells, and your IBA or 25# weight vest. Can be found HERE at our exercise library. So, if you got 60 SBGU on Session 1, today you would go 6x reps (60x.1) plus 2 rep or 8 reps, every 90 seconds. Shorter session today …. around 50 minutes. Note that we only do 3x Reps today at 90%. This is hard! If you can’t get 3x reps in the interval, drop to 2x reps.
Don’t touch line at turns. No warm up today - go right into the 300m Shuttle. Third time we’ve done this, and it isn’t getting any easier! Killer without a vest. Double killer with a vest! Should be a short session today. Use SESSION 4 Results for today’s Box Squat progression. All us lab rats made these reps today unbroken. We’ll re-asses 1RM’s next week.